For the golfer, be he a plus man or a weekend golfer. Turnberry offers two of the finest golf courses in the world with one of the finest hotels in Scotland perched on the hill overlooking the courses and with wonderful views across the Firth of Clyde to the Island of Arran. To see the sun setting behind Arran hills on a quiet summer night is an unforgettable sight. At Turnberry Hotel there is everything a holiday-maker could possibly wish for, with its indoor swimming pool, games room, lounges, etc. and tennis courts and pitch and putt course within its grounds. It is only 18 miles from Prestwick Airport and is easily within the reach of visitors from all over the world. This is a favourite hotel for overseas visitors who come to play on the famous golf courses and is an ideal centre to explore Carrick with its history dating back from the 12th century, its many historical buildings and its wonderful mild and sunny climate where figs and peaches grow outside on garden walls at nearby Culzean Castle. 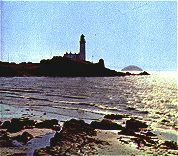 While Turnberry is the nearest main venue for golf enthusiasts they need not be confined to its courses during a holiday in Maybole. 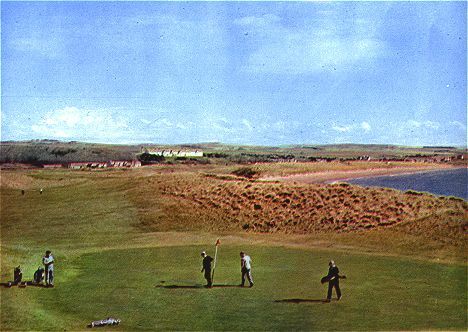 All the famous Ayrshire courses such as Prestwick, Troon, Gailes etc., are within easy reach of the town and visitors can play on a different course each day without having to travel far to reach them.